Trees under stress are more vulnerable to pests and diseases. Mechanical wounds to trees such as pruning and cutting create vectors for bacteria, fungi, viruses, and diseases to enter trees. Strong, healthy trees are able to sustain minor damage but if a tree is weak, it takes no time for pathogens to get the upper hand. Signs and symptoms of tree health issues include abnormal leaf color or shape, white powdery substance on leaves, holes in leaves, high populations of insects or pests, presence of thick white webs, bark cankers, non-seasonal leaf drop, leaves missing from large areas of tree, or discolored bark. Causes of poor tree health are numerous and may also be a combination of any of the following factors. Poor tree health can also be caused by poor tree maintenance practices, such as "topping", over-zealous pruning, improper mulching, poor irrigation, soil removal, incorrect use of pesticides/herbicides, and improper fertilization. Trees not planted according to their mature size or those that are unsuitable to the environment or local climate may also have problems. Issues with the soil such as soil compaction, incorrect pH, poor soil nutrition, or inappropriate drainage will also affect tree health. Animals, birds, and insects burying into tree or chewing roots along with excessive heat and drought may also contribute to tree health problems. 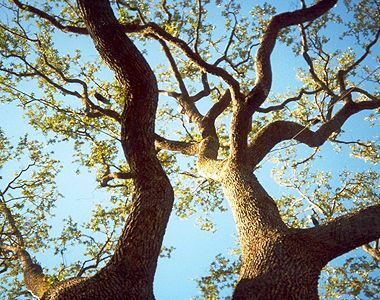 Common pests and parasites to Texas trees include Fall Webworm, Twig Girdling Beetles, Oak Gall Insects, Leaf-Cutting Bees, Giant Bark Aphids, Elm Leaf Beetle, Barklice, and Soapberry Borers. 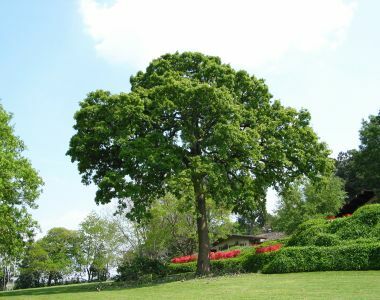 Diseases and fungi such as Oak Wilt, Hypoxylon Canker, Bacterial Leaf Scorch, Fusiform Rust, Oak Decline, and Mealy Oak Gall can have deleterious effects on weak and vulnerable trees. Proper diagnosis and treatment by a licensed arborist or pesticide applicator will ensure your trees get the attention they need. Ensure trees are planted in a location appropriate to their mature size and suited to your climate and lifestyle. For example, it would not be appropriate to plant a cool-climate tree, such as a Blue Spruce, in Texas, where temperatures often exceed 100 degrees in summer. Save valuable time and money by periodically checking the health of your trees. The earlier a problem is found the sooner it can be treated. Use only licensed arborists and pesticide applicators. Verify all licenses and check all references. Ask how long treatments are effective? How long before results are apparent? Once treatment is completed, what are the chances the problem may re-occur? Ask the arborist what you can do to prevent future problems.